The Blue Lake region in Ontario has an addictive quality to it — that's for sure. All the staff working at Blue Fox Camp, where our canoe trip began, were all returning guides who had eagerly chosen to work at this remote lodge year after year, including Peter Roberts, an environmental engineer from Ottawa who took his holidays to labor here and revel in the scenic splendor of the Penokean Hills since his first visit some twenty years ago. Chris Moose and Brien Konopka came to the work at the camp the previous year, taking it on as a summer job between post-secondary school (Chris was actually one of my students at Sir Sandford Fleming where I teach part-time), and returned immediately after school was out. Even the Chef, Evan Williams, who the lodge owner, Doctor Morgan, picked up hitchhiking at the age of fourteen, couldn't resist the invitation to spend time cooking at the camp and has done so for the last dozen years. And then there was Jay Mothersill, owner of PaddleSchack in Muskoka and one of the canoeists who were joining me on the trip (and also a past student of mine from college), was returning to the area after a seven-year hiatus from guiding there himself. All of them were in absolute awe of the place, and so would the rest of us by the end of our trip there. The Penokean Hills and its countless turquoise lakes are sprawled out north of Elliot Lake, across one of the most rugged landscapes in Ontario. Blue Fox Camp, situated at the very bottom end, on the south shore of Kirkpatrick Lake (known locally as Blue Lake), is the centerpiece and acts as a perfect starting and ending point for exploring the area. My original intent was to access the chain of lakes on Twodee Lake, at the northwest corner of the Blue Lake region, using Seymour Road from Highway 129. That was the established access point when their was still a canoe route established. But in 1981 the paddle loop was no longer maintained or promoted by the Ministry of Natural Resources, and since then Seymour Road became more then a challenge to navigate by even a four-wheel drive vehicle. There was also an option given to me by William (Sandy) Millroy, a Ministry of Natural Resource employee who first informed me of the Blue Lake paradise; a new logging road that came close to the northeast end of Duval Lake by veering off an older logging road that arched across the top of the region at kilometer 20. It wasn't the best of shape either, and besides, it was the logging roads encroachment in to the area that Sandy perceived would be the demise of the Blue Lake system; so we opted out for that way in as well. Flying in and out of Blue Fox Camp - www.bluefoxcamp.com - by bush plane from Timber Wolf Air in Blind River - www.louiesoutpost-timberwolfair.com - was our choice of entry. Not only was it the ethical choice, it was also the easiest and the cheapest way in. 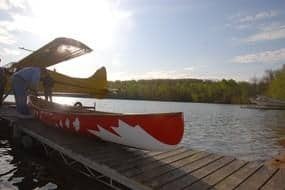 At a cost of $700 for the flight in and out, which was split up between the four of us going (Jay Mothersill and his business partner at PaddleShack, Jeff Dupuis, and Ashly McBride — a.k.a. Speedo Man — and myself), you couldn't go wrong. Blue Fox Camp got its start as a lumber camp. Large companies, such as Hope Lumber, took out a good chunk of the huge stands of white pine that once existed here. Even some of the small trout lakes to the south of the camp are blast pits made by the loggers needing watering areas for the horses hauling logs. By the early 1940s, however, Blue Fox changed over from lumber camp to fishing lodge when the first owner, Foggy Swiss, brought rainbow trout from the Ganaraska Trout Farm. Now the cluster of aqua blue lakes and crystal clear streams are alive with trophy brook trout, feisty lake trout and self-sustaining rainbow — a rarity in Canada which happens in only 1% of the countries waterways. Foggy Swiss eventually sold Blue Fox Camp to Wes Tapp, who then sold it to the Fox Family, who lived here year-round until they sold it to Doctor Morgan, an oral surgeon from Toronto, in 1991, who is now desperately trying to protect the area from overharvesting of the fish from old-fashion angling practices and blind-sighted logging interests. How incredible of a story this really is. A logging camp, changed over to a fishing camp, that is now in the midst of changing over to a futuristic environmental retreat for nature-lovers who like to catch-and-release trophy rainbow trout stocked over seventy years ago. Just by wandering the lodge's main building you can sense the history (and future) of this place. Paintings adorn the walls, ranging from fly-fishing oil-on-canvas done by Martin Solberg and Jon Wright to native spiritual art by Norman Knott and Ivan Shawana. The camp library even contains books such as Casting and Fishing the Artificial Fly by Caxton, Path of the Paddle by Bill Mason and Preserving the Sacred by Michael Angel. . Check out my blog next week for part two of this story and see how incredible this "lost" canoe trip turned out to be.